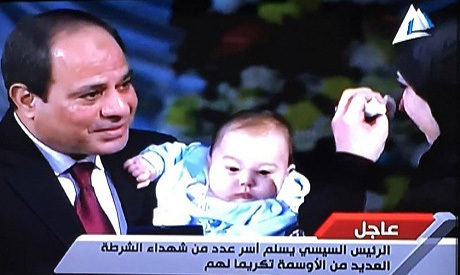 Egypt’s President Abdel-Fattah El-Sisi honored on Saturday the widows, children and parents of police martyrs during the national Police day celebration in New Cairo’s police academy. The president also laid a flower wreath on the monument that commemorates police martyrs..
El-Sisi is scheduled to give a speech during his visit. On 25 January 1952, Egypt’s police fought a heroic battle against the British occupation in Ismailiya City, overlooking the west bank of the Suez Canal. The British occupation, which was present in Egypt from 1882 until 1956, issued a warning to the Egyptian forces to evacuate the area, so they can take full control of the Canal, but the police forces stood their grounds. Fifty police personal were killed, and over 80 were injured. On 25 January 2011, Egyptians took to the street to protest the repressive policies and brutality of the Egyptian police, under the rule of autocrat Hosni Mubarak. The uprising eventually toppled Mubarak and his regime. Last December, El-Sisi paid a visit to the Police Academy, where he said that individual violations by Egypt’s police should not take a toll on the rapport between the people and the security apparatus. El-Sisi's remarks last month came amid increased reports of torture at police stations. The only part of Egypt Sisi understands is the Police and the Army, as for the rest, he doesn't have a clue. He spent more time in his 2 failed years in the police academy, army events, or buying arms. The General only focuses on what little he understands about governing a country! "On 25 January 1952, Egypt’s police fought a heroic battle against the British occupation in Ismailiya City, overlooking the west bank of the Suez Canal"